Rue McClanahan was best known for her role of Blanche in The Golden Girls. She was a longtime supporter of animal charities such as PETA and Farm Sanctuary. She passed away in June, 2010. 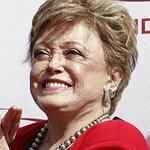 Rue McClanahan has passed away, but we remember her charity work. Google trends for "Rue McClanahan"
We don't have any videos related to Rue McClanahan.